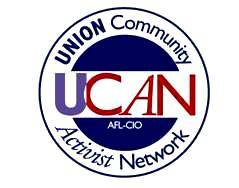 The Southeastern Connecticut Central Labor Council, AFL-CIO and United Way team up to sponsor Union Community Action Network Training - UCAN. As part of this four-session program, labor volunteers are trained on the information and skills needed to refer co-workers, family members and neighbors to existing social services. Building a more caring community! UCAN help working families by changing the economic environment and building power for workers. UCAN help build a strong political voice for working families. UCAN help each other through community resources. UCAN help build a strong labor movement. UCAN be the "voice" at your workplace and community to help working families. UCAN do all this and more because you are a UNION COMMUNITY ACTIVIST.